Eupen (German ( [ˈʔɔʏpn̩]) and French ([øpɛn]), previously known as Néau in French) is a city and municipality in the Belgian province of Liège, 15 kilometres (9 miles) from the German border (Aachen), from the Dutch border (Maastricht) and from the "High Fens" nature reserve (Ardennes). The town is also the capital of the Euroregion Meuse-Rhine. First mentioned in 1213 as belonging to the Duchy of Limburg, possession of Eupen passed to Brabant, Burgundy, the Holy Roman Empire and France before being given in 1815 to Prussia, which joined the German Empire in 1870. In 1919, after the First World War, the Treaty of Versailles transferred Eupen and the nearby municipality of Malmedy from Germany to Belgium. German remains the official language in Eupen, and the city serves as the capital for Belgium's German-speaking Community. The city has a small university, the Autonome Hochschule in der deutschsprachigen Gemeinschaft, offering bachelor's degrees in Education and Nursing. In 2010, Eupen's association football team, K.A.S. Eupen, became the first club from the German-speaking Community to play in the Belgian Pro League. On 1 January 2006 Eupen had a total population of 18,248 (8,892 males and 9,356 females). The total area is 103.74 km2 (40.05 sq mi) which gives a population density of 175.90 inhabitants per km2. 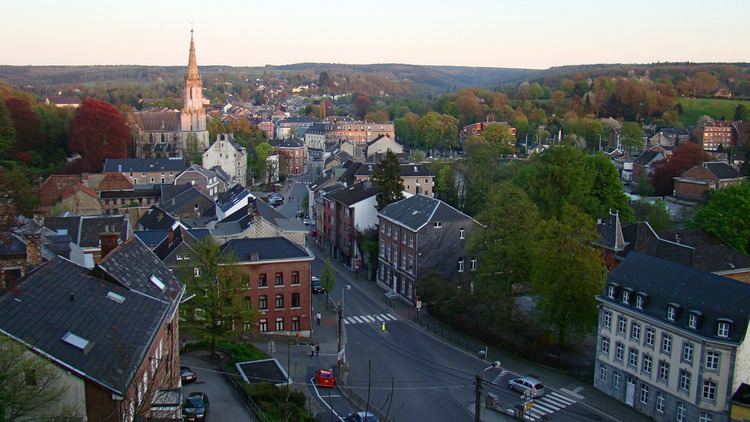 Eupen is considered in Belgium to be a Roman Catholic region with strongly conservative views. Eupen and the St. Nikolaus Chapel were first mentioned in 1213 as part of the Duchy of Limburg. In 1288, after the Battle of Worringen, the Duchy of Limburg was annexed by John I of Brabant. Brabant and Limburg were conquered by Burgundy in 1387, and Eupen was burnt to the ground during the war against the Guelders. Burgundy was dissolved in 1477 by the Austrian Habsburgs who then inherited Eupen after gaining both Limburg and Brabant. Habsburg Holy Roman Emperor Charles V granted Eupen the privilege to conduct two markets per year in 1544. In 1555, both Brabant and Limburg were passed to the Spanish branch of the Habsburgs. Ten years later, Protestantism was mentioned for the first time in the town. In 1582, during the Dutch Revolt against the Spanish Habsburgs, rebels burnt Eupen but did not take control of it. Bubonic plague reached Eupen in 1635, with devastataing consequences. Eupen obtained its own court of law in 1648, and in 1674 received city rights, giving it greater recognition and autonomy. Six years later, textile manufacture was introduced to the city. In 1713, with the Treaty of Utrecht, Brabant and Limburg were returned to the Austrian Habsburgs. Revolutionary France took the city in 1794, incorporating it into the Département Ourthe, préfecture Liège and sous-préfecture Malmedy. Following the Congress of Vienna in 1815, Eupen became part of the Prussian Rhine Province. All Prussian possessions became part of the German Empire in 1870, while Eupen itself enjoyed its popularity as a spa town. Records show that a weaver named 'Schunck' was established as early as 1776. His eldest son, Nikolaus Severin Schunck (1799–1865), had six sons, of whom the third oldest, Arnold, would later found the firm in Heerlen. The youngest son, Joseph, remained at the weaving mill and there is still a weaving mill in Kettenis run by descendants of Nikolaus. The company became the famous Schunck. After the First World War, the 1919 Treaty of Versailles transferred Eupen and the nearby municipality of Malmedy from Germany to Belgium. The effect led to the formation of extreme right-wing Nazi-like groups in Eupen. From 1938 the Vesdre Dam was constructed (completed in 1950), creating Lake Eupen. In 1940, the German Third Reich invaded Belgium; in an attempt to reverse Versailles, Eupen and Malmedy were annexed to Germany. Later that year, Eupen was declared to be a city "Free from Jews" as its entire Jewish population was killed in concentration camps. In September 1944, American forces reached Eupen which became a centre of fierce fighting in the Battle of the Bulge. The following year Eupen was returned to Belgian control and was tried its first Nazi for war crimes relating to the extermination of Jews. Trials continued until 1952. In 1949, the left tower of the St Nikolaus Church burnt down. The city centre was affected by flooding in 1953 and demolished in 1973 to create car parks. Eupen merged with the municipality of Kettenis in 1976, amidst protest from that town. In 1980, following a state reform ten years earlier, the German-Speaking Community of Belgium was established and Eupen was named as its capital. Rheinish Carnival occurring around Rosenmontag. K.A.S. Eupen, founded in 1945, is the city's main association football club and play at the 8,000-capacity Kehrweg Stadion. In 2010, after winning a play-off, the side became the first club from the German-speaking Community to reach the country's top flight, then known as the Belgian Pro League. They were relegated after one season, returning to the top level, now known as Belgian First Division A, in 2016.